I have a rule for my house: no more than a third of the artwork on my walls is allowed to be gaming-related. This rule fell apart pretty quickly when it became clear just how much beautiful video game artwork there is out there. This post originally appeared on Kotaku UK, on July 24, 2014. Once, all you could really get was posters designed for the walls of kids’ bedrooms; now there is a huge array of video game art that grown adults can frame and hang up without embarrassment (although I do still have a few framed posters around the place. Don’t tell anyone). I now have a constant rotation of game art going on. If I didn’t, my walls would be adorned by nothing else. People ask me all the time where to get quality game-artwork, so I’ve put together some suggestions. If you have any of your own, please leave them in the comments - I intend for this to be an evolving resource. A quick tip: it’s almost always more economical to do your own framing for special pieces, or find a local framer who won’t rip you off, rather than ordering framed pieces online. Getting glass-framed art delivered from abroad, especially, is ruinously expensive - and if you live in the UK, like I do, shipping costs will be the bane of your life. Good framing is never cheap, but if you have something special - like these gorgeous objects - it’s worth doing. Cook & Becker offers the highest-end game artwork that I know of: top-quality prints from studios like Naughty Dog, Clover, DICE, BioWare and thatgamecompany. It can get very expensive, but it’s also the best game art you’re likely to find anywhere. I treasure everything I’ve got from them. There’s too much gaming-related art on Etsy to even mention a hundredth of it, and not all of it is good or interesting, but there are nonetheless some real finds on there. 8 Bit Acrylic does paintings of old games and characters, for instance. A great advantage of Etsy is that lots of it is made to order, so it’s a good place to go for something custom. It’s also not just prints you’ll find here: there are paintings, models, all sorts. You just have to set aside an hour to browse. Fine Art America collects together designs from a variety of artists, and the games section is pretty populous, if not the absolute best. Don’t be fooled by the name - happily, they ship worldwide. 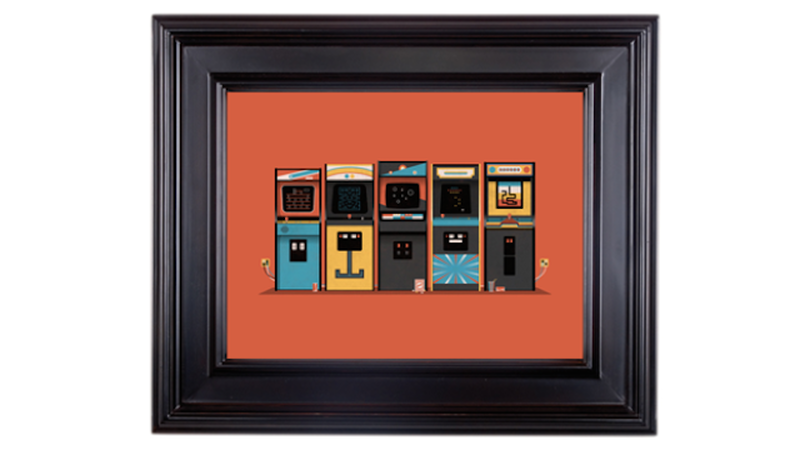 Red Bubble is a giant site where all sorts of artists share and sell a squillion designs, but there’s a lot of great gaming stuff in there - for instance, Steph Caskenette, who does amazing Nintendo collage pieces. I am 8-Bit is a gallery in LA that I continually forget to visit during E3. I always kick myself afterwards. They’ve done everything from this jaw-dropping Zelda room to these Ratchet and Clank prints to all sorts of cool installations, often working with game studios, and their store has a continuously changing selection of original, unique pieces and prints. Another big site with lots of designs, but their specific gaming section has a gigantic array of game art to choose from. Seriously gigantic. A huge number of artists showcase and sell things here. You can also get iPhone cases, t-shirts and so on, as well as prints. Marinko Milosevski does beautiful movie-poster-style artwork based on everything from Resident Evil to Pokemon, at good prices. I own the Pokemon Red/Blue/Green posters and I love them. The Beast is Back does hyper-cool pop-culture art - more movies and anime than games specifically. I didn’t actually know until this morning that DeviantArt sold prints, but hey, it does. Individual artists put various work up for sale. There are probably thousands of talented artists on this site who do gaming-inspired work. Gametee is a UK-based company that ships worldwide and I am totally in love with their gaming book covers (shown above). I ordered three. Artist Chris Gerringer did us some illustrations for our launch, and his adorable original art can be found on his shop - I’ve got the Super Smash Bros cartoon above on my desk. He does cartoons and other pop culture as well as games, and has a Society6 page with different, mostly non-gaming designs. Once again, if you’ve got more suggestions - particularly favourite artists - please leave them below!